Fiber reinforcement in features that are 15 times smaller than before. 40% faster fiber printing process. Increased print reliability with additional sensors in the print heads. This all wraps up into a new printer that’s easier to use and prints even stronger parts. Two years ago, MarkForged blew everyone a way when they unveiled the first ever 3D Printer that could produce parts made of Carbon Fiber, Kevlar and Fiberglass at the SolidWorks show. It was the first time ever you could make end-use and workable parts, strong as aluminum (and a fraction of the weight). And, you could get it all in a printer that sits on your desk. MarkForged has a lot of happy customers by offering a one-of-a-kind machine, backed up with rock solid reliability, and the included Eiger software that is designed to be extremely powerful, while remaining intuitive and easy-to-use. In our year of working with previous generation Mark One 3D Printer, we can certainly vouch for the reliability of this printer. The MarkForged Mark One is known around here as the printer that “just works.” However, bear in mind there are no miracles. Like any 3D printer, part of the operation includes the basic upkeep such as build plate levelling and the occasional calibration to keep things running smoothly. 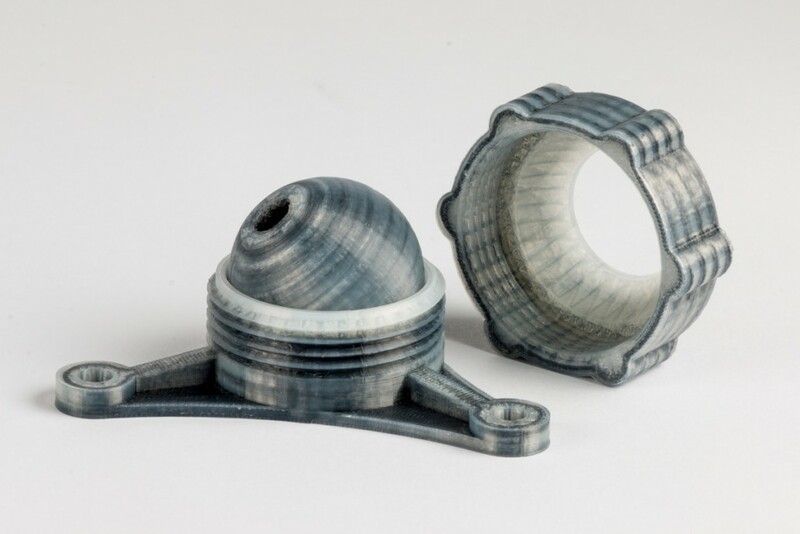 With the Mark Two, MarkForged is taking things one step further. While the 40% faster fiber print speed is a welcome addition, we never really found the previous generation to be “slow” for an FDM printer. The biggest breakthrough in our eyes being the ability to fit Fiber into areas and features 15 times smaller than the previous generation. We certainly came across parts and fine features that the Mark One simply couldn’t fit fiber into the build, leading to redesign of he model or tricky work-arounds. The new Mark Two fiber printing capabilities eliminate many of the limitations of the previous generation. MarkForged has managed to take what is already a reliable, well-designed printer, and improved key aspects to really take it to the next level. The enterprise kit allows you to print fiber material with a heat deflection temperature of 140°C. This is especially important for those of you in the aerospace and automotive industries. Company admin portal: gate access to files, what visible for who, controlling user accounts, access, etc.. I encourage you to request a demo with Objex Unlimited. The Mark One was a fantastic innovation that delivered a solution no one else can. The Mark Two takes that innovation to the next level. 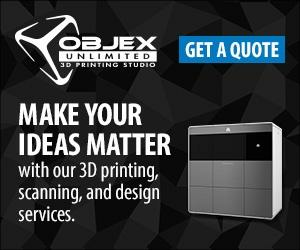 Objex Unlimited 3D Printing Studio is a 3D solutions provider and 3D product reseller specializing in 3D Printing, 3D Scanning, 3D Design and 3D Services. We’re leading the 3D printing revolution to explore, develop, and commercialize new applications in 3D.Leveraging unparalleled expertise in 3D technologies, we work with you personally to find a product or solution that will save you time, effort, and money. We will bring your ideas and designs to life by creating working parts, beautiful full-colour models, and rapid prototypes. Authorized resellers of 3D Systems, Artec, Markforged and LMI Technologies. This article was initially published in the June 2015 Issue of Graphic Arts Magazine. 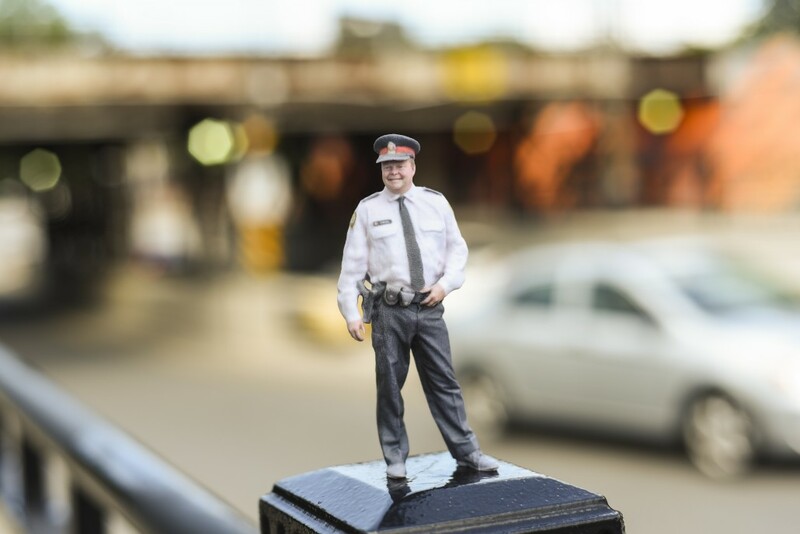 In this first of several monthly features on 3D printing by Toronto’s Objex Unlimited 3D Print Studio, Brand Manager and Marketing Coordinator Matt Belo explores the fascinating world of 3D ColorJet Printing. 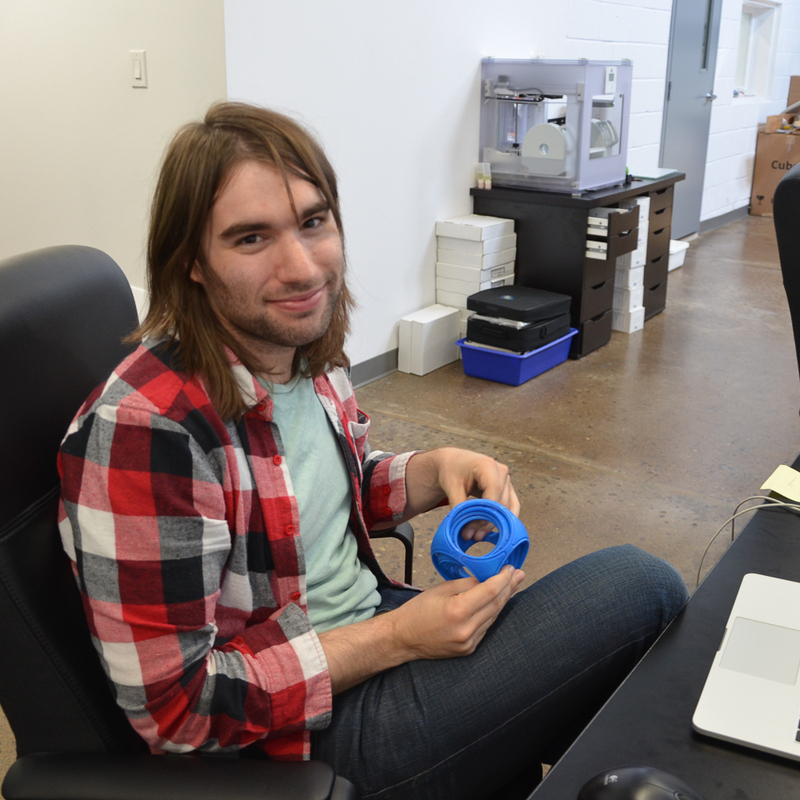 These articles are initially written for a Graphics/2D Printing Audience. ColorJet Printing (CJP) is an additive manufacturing process used to create full-colour, photo-realistic 3D models. The range of applications includes concept models, marketing materials, natural models (including humans, animals, geographic/nature images, 3D selfies, etc. ), artistic projects and architectural designs, to name a few. These printers are the top choice to print 3D models with stunning realism. Many traditional colour 3D Printers operate using multiple print cartridges, each containing a single-colour material. With these printers, the number of cartridges your printer can utilize limits the number of colours in your print. In other words, if you have 5 colour cartridges, your model can contain only 5 different colours. With ColorJet printing, because the colours are mixed in the printer, you can get very complex colouring – including gradients, textures, patterns and skin tones. You can print in full CMYK, giving you millions of colours. The additional benefit is you can apply a ‘texture-map’ to your print, as opposed to breaking your design file into multiple sections and colouring each one manually. Basically, you’re taking a 2D picture and wrapping it around a 3D model. This is the only method to get photo-realistic coloured models. 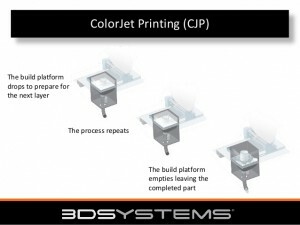 The ColorJet Printing process involves two primary components: Core™ and Binder material. The Core material can either be a gypsum-based or plastic-based powder. For the first layer, the print bed starts at the highest position in the printer. A roller is used to spread a very thin layer of Core powder across the print bed. Once there is a thin layer powder across the print bed, the printer selectively jets coloured ‘Binder’ material in specific areas where the 3D model is being built to solidify the Core material. The different coloured Binder materials are mixed together to produce millions of colours – in the same way a 2D Printer combines ink. Once the Binder is applied, the process repeats, spreading across a new layer of Core material and using Binder to attach that material to the layer below. After several thousand layers (depending on the size of the model), the end result is a full-colour, three-dimensional model. eliminating the need for any support material. In their unfinished state, the models are extremely fragile, therefore you must extract the part from the powder very carefully. Once you have extracted your part, you use air to blow away excess core material (which gets recycled back into the machine), sand your part to get a smooth finish, and then dip it in cyanoacrylate (superglue) to make it stronger. Your file needs to follow the general rules of a “Print-ready” 3D file. This means it needs to be completely closed (or watertight) and each of its edges needs to be shared with two polygons. Additionally, with ColorJet printing, it needs to be a certain thickness so that the model can actually support itself in the printer. To save on material costs, ColorJet models are generally hollowed. Most 3D printers use “.stl” files, but with CJP, you need to provide a colour 3D file – generally a .zpr or .wrl file. Anything else must be converted, along with a texture map file (usually .jpeg or other 2D formats) that contains all the complex colour data that will be applied to the 3D model. There is a bit of a learning curve to preparing these files, so I recommended you contact a ColorJet Printer operator to give you advice on preparing your files. Objex Unlimited is happy to share this type of information. Not to toot our own horn, but Objex Unlimited is known for producing some of the best colour models in the world. While there are a range of 3D Printers in the ColorJet Printer line, the 660Pro is one of the printers that includes many key features – full CMYK colour, attached model finishing chamber, a faster-than-average print speed, and a larger-sized print bed. It’s also quite affordable when compared to other professional-level 3D printers. However, there is a full range of ColorJet Printers that make up the ProJet x60 series, from the more budget-friendly ProJet 260C, to the large-build area of the ProJet 860Pro. They also have the ProJet 4500, which can print CMY plastic powder, for a more robust model when accurate colour is less of a concern. If you have any further questions on anything 3D related, please don’t hesitate to contact us. Or come visit the studio—at Objex Unlimited, the doors are always open.